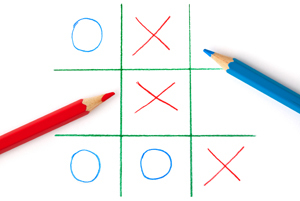 There's another interesting Tic-Tac-Toe variation called Notakto. Like this version, the object is to avoid getting 3 in a row, but in Notakto, both players are playing X. Working out a winning strategy is an interesting exercise. Numerical Tic Tac Toe is a variation invented by the mathematician Ronald Graham. The numbers 1 to 9 are used in this game. The first player plays with the odd numbers, the second player plays with the even numbers. All numbers can be used only once. The player who puts down 15 points in a line wins (sum of 3 numbers). How not to lose when going first. If you can complete three crosses in a line, do so. If not, place your cross in a square adjacent to your opponent’s last move. How not to lose when going second. If opponent takes the centre square take a corner square, else take the centre square. If you can complete three in a line, do so. Else, if your opponent has two crosses in an open line, block that line. Else enter your move in an adjacent square to your opponent's last move.